Nearly half a million people die of malaria each year, 90% of whom live in Africa. This number has come down dramatically since the turn of the century. Between 2000 and 2015 major international interventions, including the distribution of mosquito nets, has resulted in a 42% reduction in new malaria cases and a 66% fall in malarial mortality. More than 290 million mosquito nets were distributed in sub-Saharan Africa between 2008 and 2010. Mosquito nets are being used in pest protection for plants, chicken coops, rope, football goals and wedding veils. They are also being used as fishing nets, which is the focus of this article. Some view mosquito-net fishing as a growing problem. There are those who point out that using them for fishing is misuse because they were distributed to manage malaria. Fishing with mosquito nets is also widely considered to be environmentally destructive and a threat to fish. A number of countries, including Tanzania, Kenya and Madagascar, have tried to control the use of nets by imposing restrictions on the mesh size that can be used. It’s easy to criticise poor communities for the misuse of this resource. But for a family, securing protein today may trump preventing malaria tomorrow. Our quantitative study on the coast of Kenya shows that while mosquito net fishing is locally common, it may not always affect malaria protection. We interviewed senior family members from traditional Giriama homesteads in a coastal community in Kenya. We found fishing with mosquito nets to be common – involving 50% of households surveyed. The majority of fishers were male, busting previous assumptions that women largely used this method. People used the nets to catch young fish and prawns to eat at home and sell on, playing an important role in their livelihoods. Fishers at the site reported using old or surplus mosquito nets. As a result, bednet coverage was no different between families fishing with mosquito nets and those not. 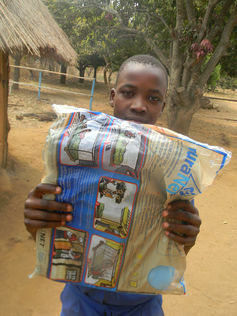 Mosquito nets are distributed in Africa to fight malaria but often people find other uses for them. Shutterstock. We discussed with the participants what fishing with mosquito nets means to their families. They cited the provision of food and income, and the ease of use. But they also expressed concern about the potential impact on the fishery from toxic insecticides and the capture of small and juvenile fish. They also commented on the allure of the method to new fishers and the extra pressure it brought to the fishing sector. As traditional farmers, the Giriama only started fishing seriously in recent years. Fishing with mosquito nets is low-cost and low-skilled work that can be done in shallow water, not requiring capital investment or ocean experience. The simple use of an available net by fishers has become a classic conservation problem involving numerous interested parties. The health sector goal is to achieve global anti-malarial targets. The fear is that anti-malaria nets being used for other purposes will mean the targets aren’t met. Fisheries managers believe use of the nets could damage fish stocks. They believe that fine-meshed netting is not selective and catches juvenile fish before they can grow or breed. In addition, the nets are treated with toxic insecticides. While local communities report declines in the abundance and size of fish, explicit links of cause and effect remain in the research pipeline. Whatever the impact, outright bans on fishing with mosquito nets based on mesh-size are likely to be extremely difficult to enforce and potentially harmful to families now reliant on the practice. As mosquito nets continue to be distributed to poor communities mosquito net fishing is not likely to disappear. A contributing factor is that the current net distribution system does not consider safe and sustainable disposal of nets. At the coastal site in Kenya, mass distributions have resulted in one net for every two people. We concluded that use of old or spare nets for fishing mediated potential negative effects on malaria prevention. People were able to use new nets to sleep under and old or spare nets for fishing. But this relationship is likely to be scenario-dependent. In another case, a similar level of net saturation might result in several fishers per household, or if nets are few, might lead to trade-offs between fishing and anti-malaria protection. How poor must you be before the net on your bed is better for you in the sea? It is likely that mosquito net fishing happens wherever mosquito nets and small-scale fisheries meet. We urgently need to grapple with the big questions around this issue: Is fishing with mosquito nets a threat to anti-malarial efforts? Is it a threat to food security? What are the real ecological consequences? How much do local communities depend on it for food and income? Only a highly coordinated, inter-disciplinary effort by all key stakeholders, and additional research, will address the problem.